I’ve been a supporter of Fusion since its inception and attended the inaugural event. I appreciate and have supported all the efforts that Fusion members have made through their initiatives and participation to further improve our great city. 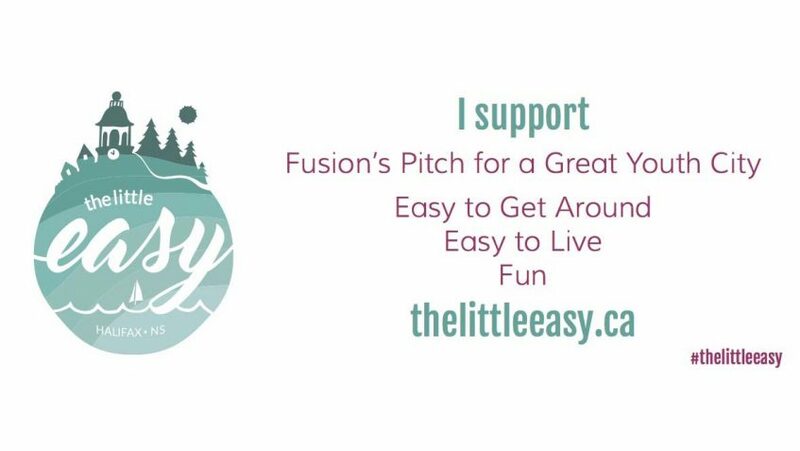 Thank you for the invitation for the launch of your new project, “The Little Easy: Fusion’s Pitch for a Great Youth City”. It was an excellent event and I support the goals of The Little Easy. Not only will it make our city even better to attract and retain young professionals, it would improve the quality of life for all residents in Halifax Regional Municipality. Little Easy objectives parallel many initiatives that I have been focusing on throughout my time on Council and will continue if re-elected in October, 2016. Over the years I have spearheaded many of these initiatives such as convincing Council to purchase the former CN Rail line to make it a 7.25 km well used active transportation corridor. We are working on connecting this trail to other trails and communities. I have worked to increase bike lanes throughout my district and will continue to advocate for funding to connect them with an overall city wide bike lane network. Cyclist safety is key and as such I convinced the former provincial government to change the Nova Scotia Motor Vehicle Act to prohibit parking on bike lanes. Working to improve our overall transit plan, I successfully pushed for new transit services and enhanced routes. We need to extend our ridership with efficient service including light rail, high speed ferries and dedicated bus lanes. As an advocate for affordable housing I will continue to press the provincial government and builders to ensure we not only have affordable housing that includes bachelor apartments but also family dwellings with community amenities. As a supporter on Council for the Mobile Food Market I have viewed the success of this pilot project and support making it a full time initiative to provide residents with access to affordable healthy food. As a member of both the Spryfield and Quinpool Business Improvement Districts I have worked with these organizations to improve overall vibrancy of these main street areas. We need greater funding for improvements and also a reduced small business tax. Throughout my time on Council I have focused on protecting our heritage and improving our parkland and open spaces (Dingle, Deadman’s Island, Chain of Lakes Trail). We need to identify key opportunities to establish and protect potential regional parks such as the Blue Mountain Birch Cove Lakes, Purcell’s Cove Backlands/Williams Lake and 100 Wild Islands. It is important for all residents to have access to wilderness areas within easy reach of where they live.